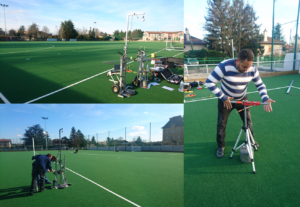 Every year, FIFA, World Rugby and International Hockey Federation organise accreditation exams for the technicians. 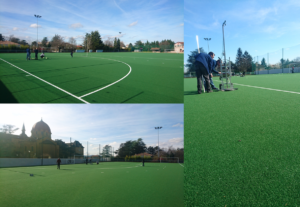 In order to prepare the technicians and to maximise their chance to succeed, Labosport France organises an intensive training session of several days, in the laboratory and on site. This is the possibility for newly recruited technicians to familiarise themselves with test methods and quality manuals of international federations. This is also a great opportunity to network with their counterparts from various parts of the world. For the 2017 vintage, Moroccan, French,Canadian and American technicians trained in Le Mans, Sainte-Foy-les-Lyon before heading towards Bergamo, Italy.